If you haven’t ever heard of oil pulling, you might just feel compelled to give it a whirl. I’ve been oil pulling for the last 18-24 months – I seem to go in spurts, where I’ll oil pull religiously for a while then get off track because life gets in the way. My oil pulling adventures started about two years ago, when I overbought coconut oil and had a pantry full of jars. I looked for all types of ways to use it, and had read about how oil pulling helps those who have had dental struggles. Fast forward a few months, and I had some personal trials with an abscess that showed up from an infective root canal and was looking for a natural way of dealing with the abscess instead of rushing in for another root canal. Related post: Oil Pulling – does it work? Y’all, dental issues are costly. And when a root canal goes bad, dentists are quick to get you in to get them fixed – as important as it is to get your dental issues fixed, it’s just as important to know how harmful root canals can be for you, too. It’s not always just black and white. So my oil pulling began ~ I religiously swished once, if not twice a day, and saw wonderful results. My abscess was no longer there, I had whiter teeth and my skin and hair looked incredible. I felt like I was on a great path for my oral care and so I have continued to incorporate it ever since. 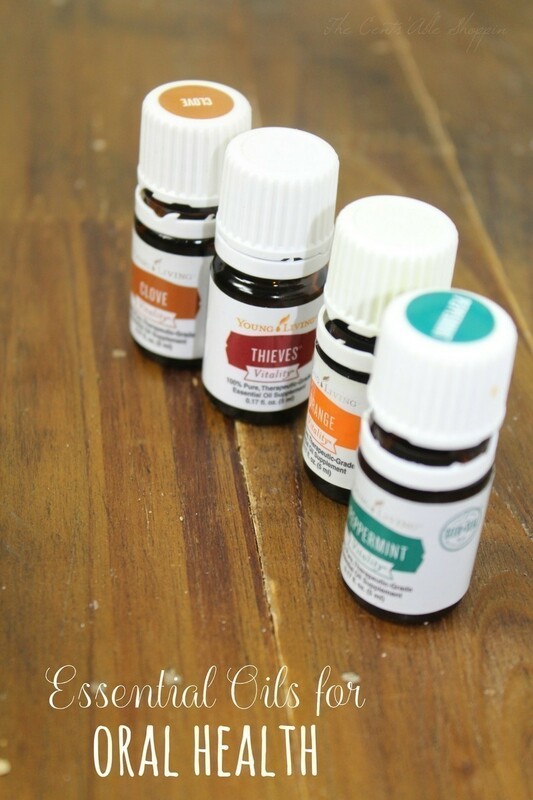 My oldest kids do the same too, and these oil chews make it incredibly easy to do it each day. Oil pulling isn’t so much difficult as it is time consuming. Mornings are pretty hectic in our house, getting everyone up, fed, oldest to school, younger kids bathed and fed, only to have to clean up and do that all over again an hour or two later… anything that can help trim time is a blessing. Dragging out a huge tub of oil and mixing up essential oils to do your oil pulling only adds minutes – and when you are trying to get OUT the door and in the car on time so you aren’t late, then minutes are very valuable. 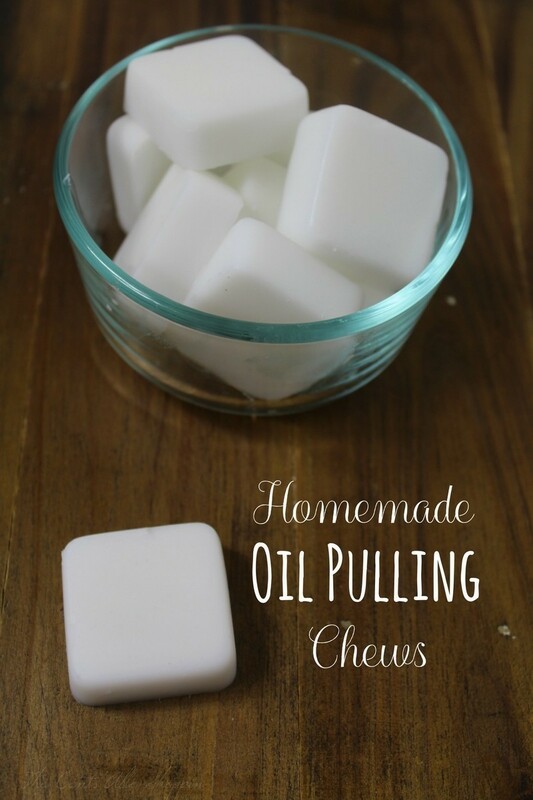 Bring on these oil chews – they are easy and take just a few minutes to make. In fact.. I was able to make a whole silicone mold of these as I made eggs for the kids for breakfast, and fed the baby in between. Multitasking at it’s finest! When you get up in the morning, just pop one in your mouth and allow it to melt – swish in your mouth for 10-15 minutes, then spit out. Note: Always make sure you spit out the oil in the trash, or outside in the yard – you do not want to spit in the sink or drains. And please understand that not all essential oils are the same – you can forego the essential oils and still see great results. But if you opt to use essential oils, then opt for a high quality oil that is labeled for dietary use (we use Young Living because they are the most transparent and authentic company). See 25 DIYs with essential oils, and use the same Wilton mold to make dishwasher tabs, too! Place the coconut oil in a ball canning jar and pop in the microwave on 20 second bursts just until melted. 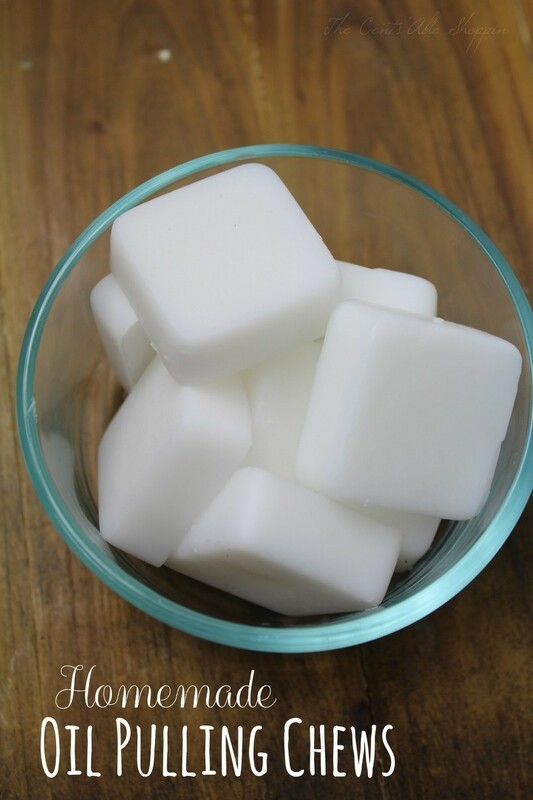 Pour into a square silicone mold. Place in the freezer to cool. We place the mold on a cookie sheet to make it easier to slide in the freezer and rest on the shelf. Once frozen, store in the freezer and use one each day as needed.